Usually, the use of solid-load technique (also called dry-load) will improve chromatography resolution. 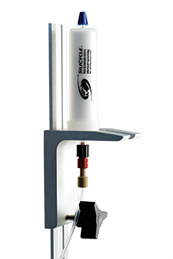 SiliaSep Solid-Load luer-lok cartridges are designed to be used with SiliaSep flash cartridges for sample loading. Either SiliaSep pre-packed (for liquid injection, various choices of media available) or empty solid-load (for silica-sample slurry) are available to better suit your needs. Note: for optimal purification performance, solvent removal under vacuum is highly recommended. For SiliaSep XL Flash Cartridges (800g and 1600g), you will need to use our XL cartridge Adapter to plug the cartridge on your system. SiliCycle’s SiliaSep Flash Cartridges are designed to be a universal closed-top flash columns (luer-lok connection). Take advantage of SiliaSep’s benefits and enhanced performance by converting your system with an inexpensive adaptor today. With Isolera systems, you can directly use SiliaSep without adapters. Even if SiliaSep does not have luer-loks at both ends like the SNAP cartridge, you can connect it to your current solvent line (if you prefer to have both ends with luer fittings, contact us for optional adapters). Note: if you are already using SNAP with your system, no modification is required. See previous point. - Option B: use only SiliaSep cartridges. No compression module will be necessary from now on. If you are using the Biotage compression modules (metal cylinders), simply link your existing solvent line connection to the SiliaSep adaptors. To do so, attach the Biotage Adaptor Kit (PN: KAD-1006) to the existing Swagelock™ stainless steel connectors, which will allow them to connect to SiliCycle SiliaSep columns. This is only if you want to toggle between Biotage and SiliCycle columns. Changing the solvent lines from your current system to a Luer-Lok one will allow direct connection of SiliaSep Flash Cartridges. No compression module will be needed from now on. To switch completely to the SiliaSep columns, simply unscrew the fittings that are currently installed on the Biotage systems and screw in the SiliaSep Solvent Line Replacement (PN: KAD-1014) with the luer connections we supply. The female luer (A), which connects to the top of the column, goes onto the flow outlet of the instrument (top hole on the instrument). The male luer (B) fits on top of the slip tip on the bottom of the column and connects to the flow inlet of the instrument (coming out of the column). Support rings will allow SiliaSep cartridges to sit on the Biotage SP1 & SP4 instruments. On FlashMaster systems, cartridges are running upside down (reversed). To use SiliaSep cartridges on any FlashMaster instrument, simply connect the SiliaSep cartridge directly on the instrument using the FlashMaster Adapter Kit (PN: KAD-1016) without the plunger. One piece holds the cartridge in place while the other connects to the solvent line. 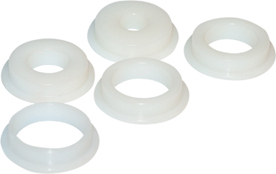 The plungers commonly used with this type of open-top cartridges can be replaced by a universal adapter kit. One piece holds the cartridge in place while the other connects to the solvent line inlet. By doing so, you will have access to wider choice of cartidges (format and sorbent) and significantly reduces the amount of hardware required (plungers). Plunger is adapted for the 10 mL SPE cartridge format. Adapted for the 60 mL SPE cartridge format. Empty Luer-Lock (with 2 frits) cartridges designed to be used with SiliaSep cartridges for sample loading. 100 cartridges & 200 frits /box. Empty Luer-Lock (with 2 frits) cartridges designed to be used with SiliaSep cartridges for sample loading. 12 cartridges & 24 frits /box. Empty Luer-Lock (with 2 frits) cartridges designed to be used with SiliaSep cartridges for sample loading. 6 cartridges & 12 frits /box.